VideoCast: Oprah for President in 2020? Hoping to limit or even end the Russia inquiry before it reaches him, Donald Trump authorizes release of a four-page memo trying to discredit the FBI and Justice Department. Trump and the White House indicated on Thursday that they will not stop the dissemination, for which Republicans on the House Intelligence Committee on Monday. The document is the culmination of an effort by Committee chair Devin Nunes to declare that the FBI and Justice Department have no legitimacy because of anti-Trump bias. Nunes, a member of the Trump transition team, supposedly recused himself from the Trump-Russia hearing last April, after it was revealed that he met White House officials who passed him misleading or even false information. The memo claims that the FBI acted inappropriately when it obtained a warrant in October 2016, from the top-secret FISA court, for the surveillance of Trump advisor Carter Page. The agency had monitored Page since 2014, over concerns that he was being recruited by Russia as an agent. Those concerns were raised further by a July 2016 trip by Page to Moscow where he reportedly met high-level Russian officials. The FBI, which has only been granted a limited review of the Nunes document, says that it is “fundamentally” flawed because of omissions of evidence and distortions. The Justice Department has said that it is “reckless” to release the document, given that it might expose sources and damage national security. This is unreal. Two of my @FBI agent/friends who work in different field offices told me they are going to resign if the @DevinNunes lie-filled memo is released. "Our jobs are dangerous enough w/o a bunch of politicians putting targets on our backs for the crazies," one said. Two sources have said that Trump is dedicated to the circulation of the memo, telling friends that he believes the document will expose bias within the FBI’s top ranks and make it easier for him to argue the Russia investigations are prejudiced. Trump has pursued the campaign against his agencies since January 2017, when he compared them to Nazis for release of information about meetings between his staff and Russian officials. He fired FBI Director James Comey in May and tried to dismiss Special Counsel Robert Mueller in June. While the removal of Mueller was blocked by White House lawyer Don McGahn, a campaign by Trump and his allies was able to force this week’s departure of FBI Deputy Director Andrew McCabe. Trump also reportedly has threatened to replace Deputy Attorney General Rod Rosenstein, the only official with formal authority to fire Mueller. I've read both memos. What's clear to me is that the sole intent of the #NunesMemo is to give the Trump administration cover to fire Rosenstein. Trump indicated on Tuesday, as he walked to the podium to give his State of the Union address, that he would release the memo. Asked by one of the campaigners, GOP Rep. Jeff Duncan, if he could guarantee the dissemination, Trump replied, “100%”. White House officials said Trump read the memo on Wednesday and discussed it with Chief of Staff John Kelly and White House lawyers. 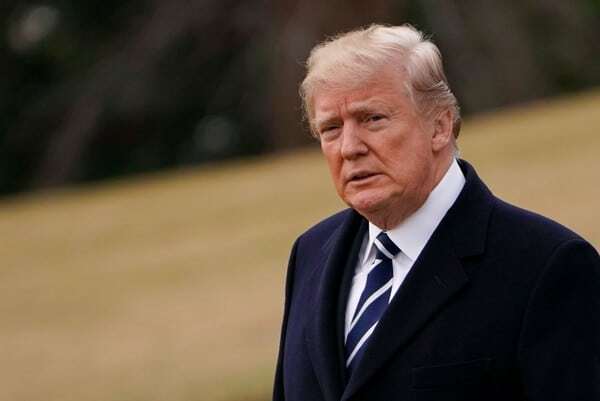 Foreshadowing his approach as another Government shutdown looms next week, Donald Trump has pushed a hard line on immigration legislation and sought to blame Democrats if it is not accepted. March 5th is rapidly approaching and the Democrats are doing nothing about DACA. They Resist, Blame, Complain and Obstruct – and do nothing. Start pushing Nancy Pelosi and the Dems to work out a DACA fix, NOW! The Democrats have insisted on legislation to ensure that Dreamers, many of whom have been in the US for more than a decade, no longer face deportation. However, the White House and hardline Republicans have rejected a bipartisan bill and are insisting on a series of conditions. These include full funding of the $25 billion Wall on the Mexican border, an end to immigrants bringing family members to the US, an end to the visa diversity lottery, tougher border security measures, and a sharp reduction in admission of immigrants and refugees. Trump repackaged the ultimatum in his State of the Union on Tuesday, presenting a path for up to 1.8 million undocumented immigrants to get citizenship in 10 to 12 years but reiterating the other demands. In the West Virginia speech, Trump indicated that he might step away from any deal and hope that Republicans can maintain their majorities in both chambers of Congress — a slim 51-49 edge in the Senate, a larger majority in the House — in November’s mid-term elections. “They talk a good game with DACA, but they don’t produce,” Trump said of the Democrats. He added that “either they come on board or we’re just going to have to really work” to elect more Republicans. In his address in West Virginia, Donald Trump proclaims that retiring GOP Senator Orrin Hatch of Utah has called him “the greatest President in the history of our country”, which includes “Lincoln and Washington”. The Trump Administration has stripped power from a Consumer Financial Protection Bureau unit responsible for pursuing discrimination cases, as it tries to weaken the CFPB. In late November, the White House imposed the chief of the Office of Management and Budget, Mick Mulvaney, as the head of the CFPB. The Office of Fair Lending and Equal Opportunity had forced payouts in several prominent cases, including settlements from lenders it alleged had systematically charged minorities higher interest rates than they had for whites. GE Capital was fined $201 million for excluding 133,400 borrowers from debt relief because of their ethnicity, the largest credit card discrimination settlement in history. PNC Bank was fined $35 million for charging higher mortgage interest rates to African-American and Latino borrowers. Provident Funding Associates returned $9 million over higher brokerage fees to minorities. Hudson City Savings Bank took a $27 million charge for redlining communities in the Northeast, denying people of color access to credit in certain neighborhoods. After BancorpSouth Bank both redlined and overcharged borrowers in the Memphis area, it was fined $7.58 million. The CFPB issued guidance in 2013 warning auto finance companies about discrimination in “dealer markups”, extra points put on the price of a car loan for minority borrowers. Ally Financial, American Honda Finance Corporation, Toyota Motor Credit Corporation, and Fifth Third Bank paid a total of $143.9 million in penalties. Now the OFLEO will be inside the office of the director, where staffers will be focused on “advocacy, coordination, and education”. The office will no longer have responsibility for enforcement and day-to-day oversight of companies, according to an e-mail from Mulvaney to staff. Mulvaney also dropped a lawsuit against payday lenders and said the agency will reconsider rules which the financial industry considers onerous. He updated the CFPB’s mission statement to include addressing “outdated, unnecessary, or unduly burdensome regulations”.